Re-marketing is a powerful online advertisement strategy, targeting the consumers who already showed interest in your product. Instead of seeing online ads that are completely irrelevant to them—which used to be a lot!—they see you. Innovations in technology have completely transformed how we, as business leaders, can market our services, making it easier than ever to reach your ideal audience. This contrasts starkly with the overboard marketing efforts of yesteryear (Sorry, Don Draper). With re-marketing, you can target those who were on the brink of converting (becoming a paying customer), but stopped just short. This not only allows you to re-engage lost visitors, but increase brand awareness. So, how do you do it? Re-marketing hinges on a little thing called “cookies”—not of the chocolate chip variety! First, let’s explain what a cookie is. An internet cookie is a simple text file that is stored in the web visitor’s device when they enter your website. This text file contains information about their behavior on your site. I’ll be frank—re-marketing can feel a little weird to consumers. When you’re wearing the hat of consumer, you may find it odd, too. It certainly raises a few eyebrows, with consumers wondering, “How do they know I looked at that product? Why am I seeing it again now?” But once you put on the hat of business owner and marketer, you understand why companies employ this strategy. This article only serves as an introduction to the concept, which can be employed on the web, social media, and other platforms. Every re-marketing strategy is a little bit different, depending on the nature of your business and what you offer. 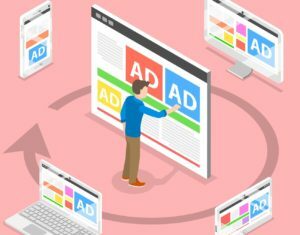 It can actually be exciting to tailor a re-marketing campaign to your business, reviewing the behavior patterns of web visitors to determine who is ripe for re-targeting.